Some may call it synthetic marijuana, but this new chemical concoction sweeping the nation is more potent than the drug it is named for, often causing hallucinations, rapid heartbeats and seizures. It can also be deadly. Also known as K2 or spice, the drug is becoming increasingly common among teens in the tri-state area, who believe it to be safe because it is often sold in convenience and grocery stores. The I-Team visited a group of teens at the Newark Renaissance House, one of the most successful adolescent residential treatment programs in New Jersey. The teens, ages 15 to 18, described the dangerous allure of the drug. It is illegal to sell K2 in the tri-state area. K2 is a manufactured substance that chemically resembles marijuana, but is designed to affect the brain more strongly. Producers will often spray the chemicals onto herbs and sell it in colorful, pre-packaged glassine baggies for as little as $3. Program Director Kobie Morgan said the uptick in K2 use is alarming. Most kids are buying it on the black market, but some are making their own concoctions. “You’re not supposed to be smoking it. It’s supposed to make your house smell good. It’s incense,” said teenager Tyler Burgos. Ahmad Thornton is another teen at the rehab center who experienced strong physical effects from the drug. “It’s like a big blackout. You don’t even know what’s happening. All you know is your heart is beating very fast,” he said. NRH case manager Kristen Lima said K2 users can display erratic and even violent behavior. “They can flip on a dime. There’ll be a swinging of moods,” she said. Tyssen Walker said after smoking K2, he felt like he was dying. He lost his breath and felt numb. “I couldn’t move. I was frozen,” he said. He said K2 use in his community of Passaic, New Jersey, ranges from teenagers to adults. Statistics suggest the problem is nationwide. 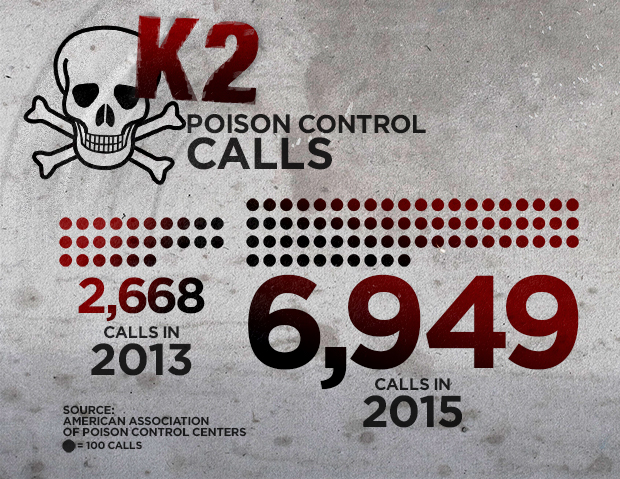 Calls to poison control centers concerning K2 rose from 2,668 in 2013 to 6,949 in 2015, according to the American Association of Poison Control Centers. Despite its growing popularity, the I-Team discovered that many probation centers and outpatient drug programs do not routinely test for K2. The drug does not turn up in a standard drug testing panel, an issue many users are well aware of, like Burgos. “I am on probation and I didn’t want to come up with a dirty urine but I didn’t want to stop doing drugs,” he said. K2 requires a separate, more expensive drug test, which discourages testing, said Lima. “It means that it’s going undetected. It’s not being dealt with,” she said. That practice could, however, change. New York City’s Probation Department told the I-team it is developing a K2 testing program for implementation early next year. Walker said he would advise other teens to avoid the K2 predicament and risk losing their lives. “It’s really that serious. Don’t try it for the first time. Don’t try it at all,” he said.